Confession time again! It has been ages since I dropped by 1 Utama. I must admit I absolutely hate battling with loads of people for a carpark space and jostling with others when the mall is packed. While I have found one way to easily find a carpark space during weekends, it still does not mean I'm ever eager to drop by this minefield of people. 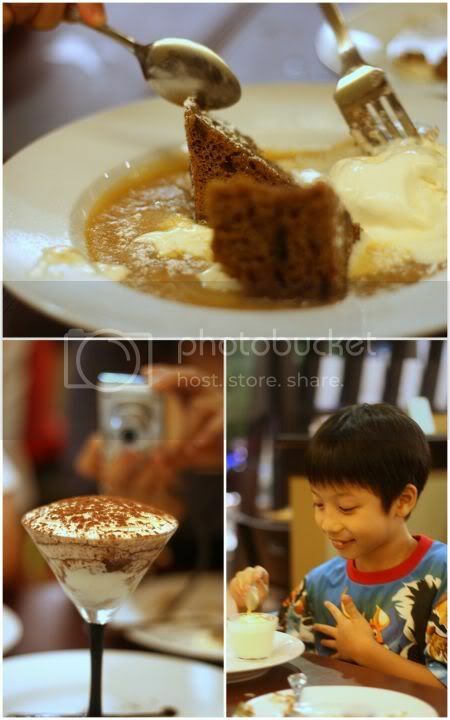 After a long absence, we finally braved the traffic and ended up here to sample these unusual snacks for a quick dessert. I have had this small place in my "to-do" list for the longest time ever but never got around to it until last weekend, when I finally got some time to r & r away. Located just opposite Cold Storage, this small store serves interesting churros (RM5.80) - that Spanish deep fried snack one can never get enough. Best thing about these "doughnuts", like some term them, are they're made fresh and as and when you order them. Crisp on the outside, these were nice on their own sprinkled with cinnamon sugar or dipped in molten chocolate lava. 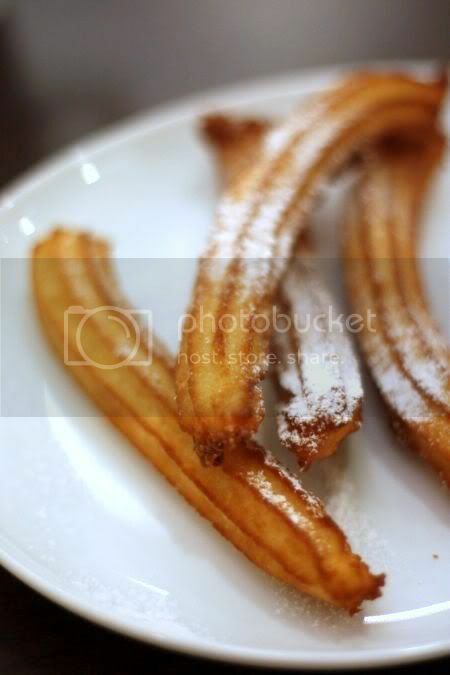 While the texture of the churros was nice, we were a little dissapointed with the watery and lacklustre chocolate dip we received that just didn't add any oomph! 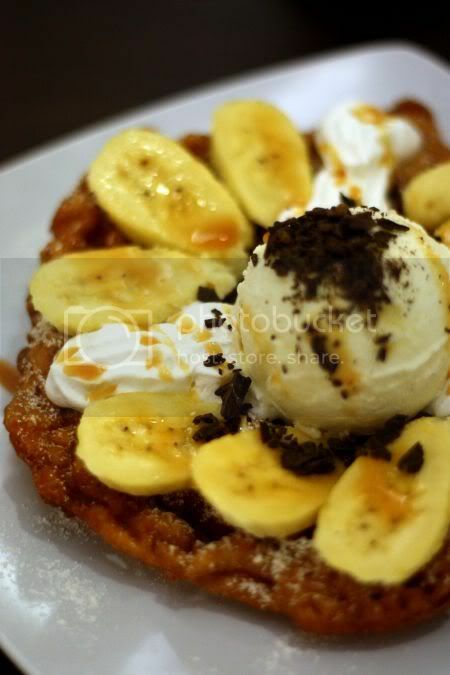 Instead, we found our epiphany with the very unusual funnel cake they served here. Made from a flour batter that is drizzled in hot oil to form a flat cake, the funnel cake (RM8.80 for the banana caramel ice cream) won us both over with its light as air but crunchy texture. Simply heavenly with chopped bananas, a drizzle of caramel and vanilla ice cream. Only problem would be to eat this elegantly, so don't order this on a hot date, unless you don't want a second date with that guy or gal ever again. The stall also does roti paratha, thick toasts, various flavours for churros including ones that have fillings, glutinous rice, cupcakes and etc. Seating is quite limited within the area and some tall tables outside. "If you believe in the power of magic......" That song keeps playing in my head the whole morning from Alan Parsons Project's Don't Answer Me (if you do want to listen to it, see my blip.fm) I guess all of us don't believe in the power of magic but definitely the power of great presentation and cheery colours. Indulge at Tropicana City Mall seems to have got those two finer points, down to the pat with its sunshine yellow interiors (cynics will probably call it too jarringly yellow) and their beautiful plating of food. A great place to chase away those Monday blues today....Indulge is run by Chef Pele Kuah who used to work in Mandarin Oriental Hotel and The Rennaisance Hotel. Hence you find little touches on the plate usually found in fine dining - that artistic sweep from a brush for the sauce, the beautifully turned and cut vegetables until they resemble flowers and leaves and etc. I especially love the Melon Salad (RM16) - a combination of rock melon and watermelon balls drizzled with reduced balsamic vinegar and a salad to win my heart over. I'm always partial to great salads and this one was pretty good with assorted leaves, finely diced green apples, walnuts, sundried tomatoes, orange segments and strangely enough, bits of canned lychees. 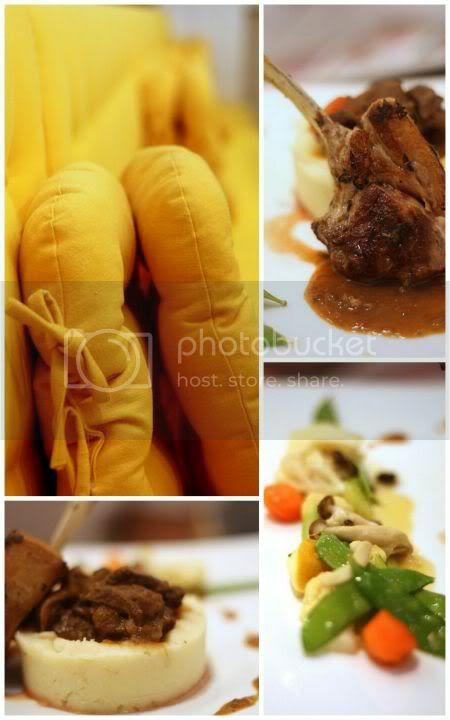 Splashie Boy had the Duo of Lamb (RM35), lamb done two ways to give you a contrast of textures and flavours of the lamb. Beautifully plated, the orange lamb goulash was encircled in a mash potato ring, while you had a very small portion of lamb cutlet on the side. Vegetables here are served to look like a beautiful masterpiece. Tastewise, we preferred the goulash more to the lamb cutlet, which had a slight gamey taste and was a little too fat for our liking. My Miso Cod (RM35) was a sight to behold, with a bright orange brushstroke decorating the plate on one side. Served on top of a wasabi potato mash (not much taste of wasabi though), the cod was a nice thick slab but I thought it lacked the juiciness I usually like in my codfish. I especially loved my vegetables and even found a cucumber cut to resemble a leaf. 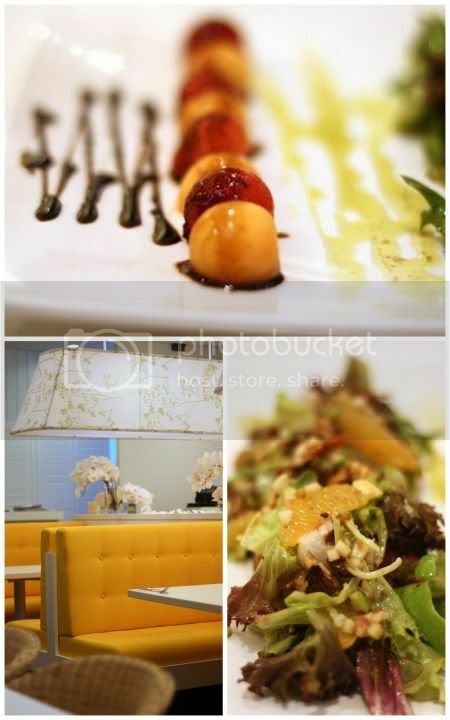 Overall, it was a pleasant dining experience and for both of us, we felt the best dish was the melon salad! Although it scores top marks for plating, food taste felt a little short I reckon or maybe we had such high expectations of this place to taste like fine dining, since the food looks similar to fine dining. Nevertheless, we definitely won't mind returning for their other interesting items like pastas, the grilled beefsteaks with various sauces, the salmon with vodka cream and etc. They also serve a value for money set lunch for RM12.90+ served with ice lemon tea but only for Monday to Fridays. For more bigger pictures on the place, see my Flickr set. Happy Happy who had a great time here with his family. 1. crispy bittergourd, so good that one must pinch a bit with the fingers, 2. yummiest ever long beans achar, 3. wahhhhhhhh! so much rice, 3. fiery hot dried chillies anyone to spice your life up? Getting your fingers all dirty with spicy curry, tangy achar, rice and vegetables seem to be the best way to spent the day off. At Bangsar's Sri Nirwana Maju (where people seem to be spilling out on the sidewalks), you have the option to order plain white rice or the more exotic yellow nasi briyani with chicken. You can go for the carbo-overload meal (they pile the rice here, like they own their own paddy fields) or just opt for the healthier (only slightly) vegetarian option of deep fried bittergourd slices, spinach or cucumbers in a cooling yoghurt. I especially love the slightly sourish long bean achar here and the quirky plastic spoon they give you (double bound with a piece of rubberband to hold it together). 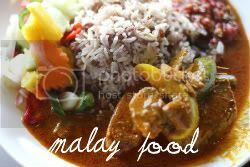 For meat eaters, they also do an excellent mutton curry and fried items like sotong and chicken are also available. 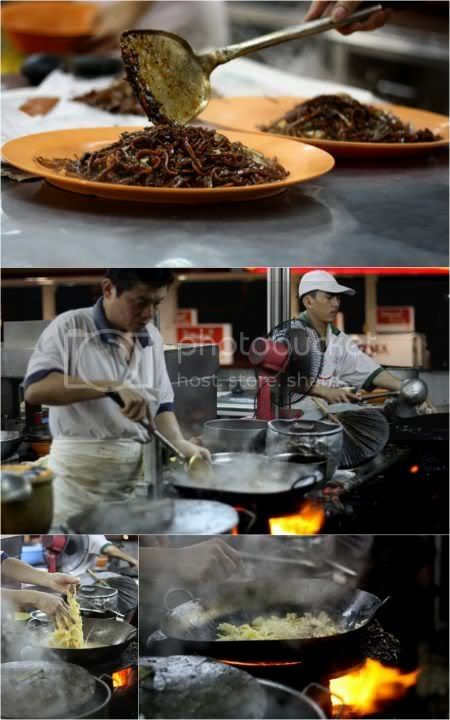 Fried noodles (the yellow wormlike or curlier instant strands) can also be ordered. Oh! Don't forget the crispy pappadums where one is never enough after you try one crunchy morsel of it. Blogging is always fun and the best bit of course is meeting new people within the blogosphere. This time round, we met two at one shot - Paranoid Android and Cacoethes Scribendi. While one is into Momijis, the other one creates these gorgeous looking bento boxes. Great meeting both of you and hope we'll see more of you on the Net and around. Since we were having a Daily Grind moment (gorgeous hummingbird and lemon drizzle cakes), it was also time for the momijis (and Kid Robot [er, not Tokidoki]'s dunny) to make an appearance. Discovered a shop in Bangsar Village II called Emma K that sells momijis including the new ones by a Chilean designer called Camilla De Gregorio. A little different from the other designs, this series has a bunny all decked up in white with rainbow stripes called Busted Bunny, a bear called I Don't Care Bear and this jesus christ superstar lookalike called Coming Soon . No momiji event will be complete without a dunny hence, a lil' fat monkey brought his adorable (Tom Selleck lookalike) dunny! So adorable. * Note: Bangsar was kicking that day with Edison Chen doing his Juice moment (I heard some fans even jumped on cars to get a pix of him!) and Robert Rainford of AFC's Licence to Grill fame demonstrating his barbeque skills in Bangsar Village. Others who also joined in this mission: Cumi & Ciki, Fatboybakes, Lyrical Lemongrass, Hairy Berry, Kampungkayell, a lil' fat monkey and Paprika. "I'm gonna make him an offer he can't refuse"....says the Godfather (or Il Padrino in Italian). Fans of Marlon Brando and that iconic movie will remember that famous line (voted the second most memorable movie quote in cinema history). At this newly opened restaurant in the middle of Damansara Heights, Godfather fans will feel incredibly at home. There are posters of Brando in his famous movie persona, quotes from the movie and its sequels including one from The Sopranos in the menu but don't worry, there's no Mafia ongoings here (as far as we can see). Instead it is all about good Italian food here. Dinner here was a toss up between Leonardo's on Jalan Bangkung and this place. Reading the reviews online, we settled on this place as the home made spinach ravioli sounded good. Parking was relatively easy at night, since space could be found around the street in front of the restaurant. I vaguely remember visiting a famous law firm starting with S in this building before and parking used to be horrendous there. This place combines a bar and restaurant tucked within. On a Friday night, it had a pretty decent crowd dining here. Despite it being relatively full, service was very attentive (the nice waiter was informative and kept asking if everything was fine). The menu had salads, appetizers, homemade pasta, dried pasta, main dishes, pizzas and desserts. Not wanting to follow the Italian style of having a pasta for primi (first course) and a main course for seconds (secondi), we decided to share a nice crisp salad - the Insalata e Ruccola (RM18), a pasta and main meal from the daily specials. The simple rocket, button mushroom, cherry tomato and parmesan salad was well seasoned (every leaf seemed to be sprinkled with salt and pepper). I especially liked the reduced balsamic vinegar dressing drizzled over the leaves - so much better than the balsamic and olive oil dip they gave with the sliced bread and grissini (bread sticks). Missing out on their popular dish - the roast belly pork from the board specials, we settled for the braised pork shank (RM45). While the dish had a nice red wine flavour to it, we didn't care much for the meat that lacked enough fat to give it a melt in the mouth texture. Seems the chef used a very young pig for this meal for a healthier alternative but somehow, we preferred the sinful avenue instead since it would have tasted better. 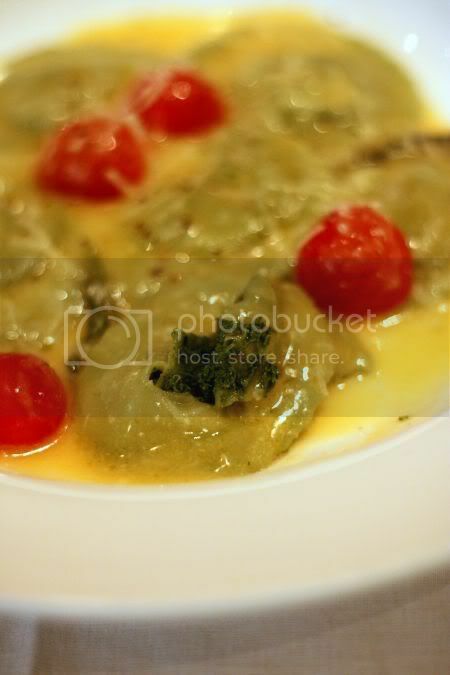 We fared so much better with the ravioli filled with spinach (RM32) and served with a butter sauce infused with sage leaves. Only 6 pieces to share between both of us (not a lot I know but enough since it is so blardy rich!) that we both loved and slowly savoured each bite. Yums to the last morsel of green coloured pasta! It definitely piqued my interest to return here to try their other home made pastas - the saffron pasta, the squid ink ones and etc. (My friend went back last night with another group of people and they also loved the food here, so I guess it wasn't just a one-night-fluke). 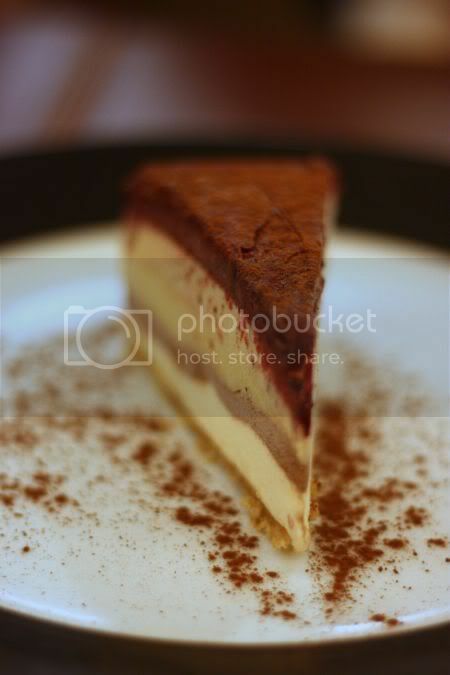 For desserts, rather than go for the traditional tiramisu or the chocolate fondant (which I thought is more French?? 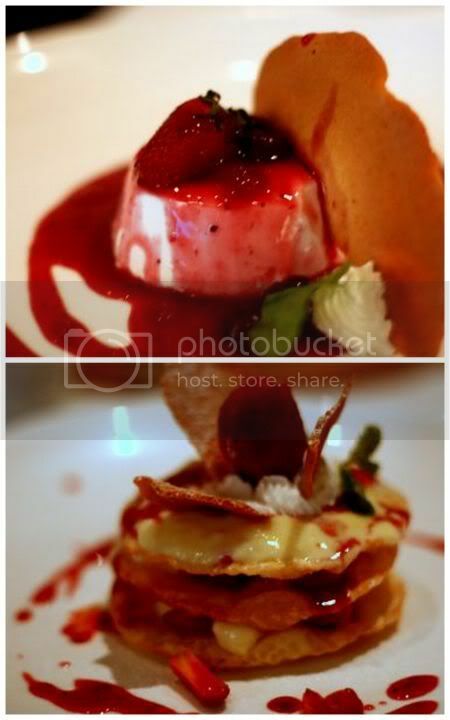 ), we went for the pannacotta (RM18). My friend who is a pannacotta expert deemed this not worthy since it had a little too much gelatine to qualify for the crown of greatness. Nevertheless, I still enjoyed it with the strawberry sauce. Weirdly enough, we also went for another red dessert - the average tasting multi-layered filo pastry dotted with strawberries concoction known as the sfogliatine di mille (RM18). Overall, a pleasant dining experience here with attentive service. Like I mentioned earlier, one would not mind returning here for another plate of homemade pasta. My only complaint about this place was the music was quite weird - a medley of 1980s songs played a little too loud for my liking as it felt just a decible lower than pub music. While I don't hate 1980s music, I found it a little weird to dine on Italian ravioli while listening to Jason Donovan and Kylie Minogue belt out their tunes. Regular readers to this blog will know, I usually celebrate my million hits count by making some homemade treat for friends. This time round, due to work commitments, I let my 3 million hits go quietly by and pushed celebrations until yesterday when a small group of us got together. When it comes to baking, I've no problems churning out baked goodies but ask me to frost or make anything pretty, I shudder as first, I lack the patience to nicely ice anything and second, my hand has a teeniest tremor hence my piping skills is slightly shaky. 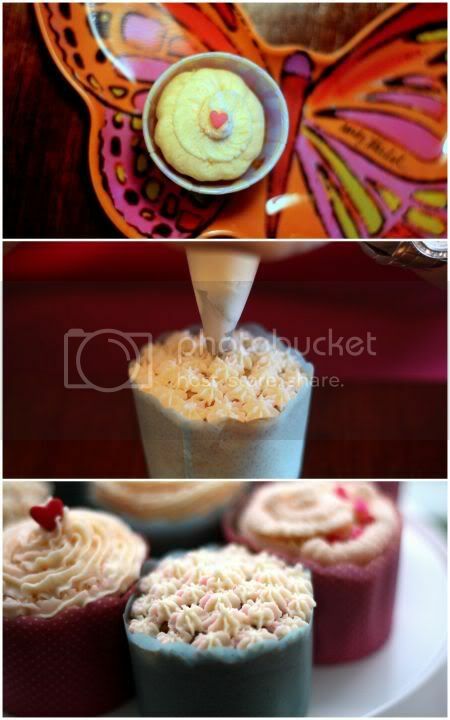 Hence when Lyrical Lemongrass said she wanted to decorate cupcakes, it sounded like a perfect match. Baking on Sunday morning didn't yield perfect results - vanilla cupcakes in large muffin-like but very pretty polka dot cases I had discovered in Bake with Yen Puchong, teeny weeny chai cupcakes that didn't taste like chai even though I used 2 bags of Gryphon Straits Tea Chai, buttercream that died on me (the eggwhites didn't see to rise, probably because I dripped a little egg yolk) and a new cake, blueberry tea cake from Bill Granger's Feed Me Now! cookbook. We gathered at Paprika's place and discovered Lyrical Lemongrass is a pro in decorating cupcakes as she's been honing her skills on muruku making. Believe me, she can make perfect circles with her steady piping hands and give any professional bakers a run for the monies! 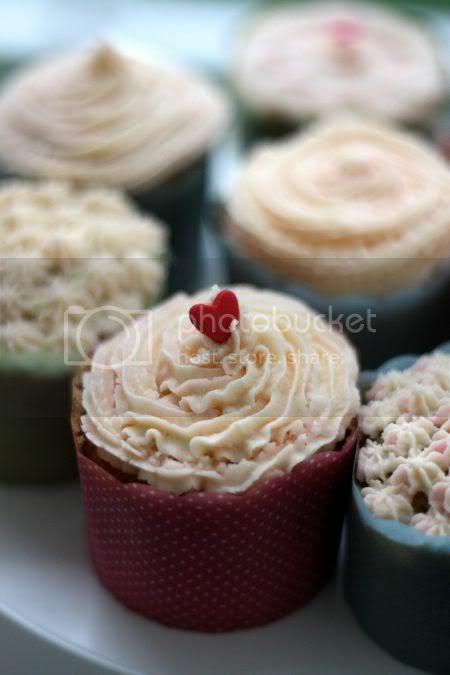 Under her skillful hands, my cupcakes became uber pretty with a barely pink buttercream whipped up by Paprika. Suprisingly the cake of the moment was this "first-time attempt" - the blueberry tea cake with a cream cheese frosting from Bill Granger's new cookbook, Feed Me Now! It calls for seasonal blueberries (currently going for a very reasonable RM9.90 at Cold Storage) and sour cream mixed with soda bicarbonate to give it a fluffy, moist and light texture that had all of us clamouring for seconds. In the midst of cutting cake, we also discovered Paprika's hidden skills - she can make cakes levitate in mid-air even better than David Copperfield! It was a great afternoon, a little hectic in the morning churning out cakes but so fun to see someone else do the decorating. Thanks to Paprika, Hunky and Lyrical Lemongrass for celebrating with me. Last but not least, thanks to all of you readers for clicking away on this blog and keeping it very alive for me to even celebrate this way. 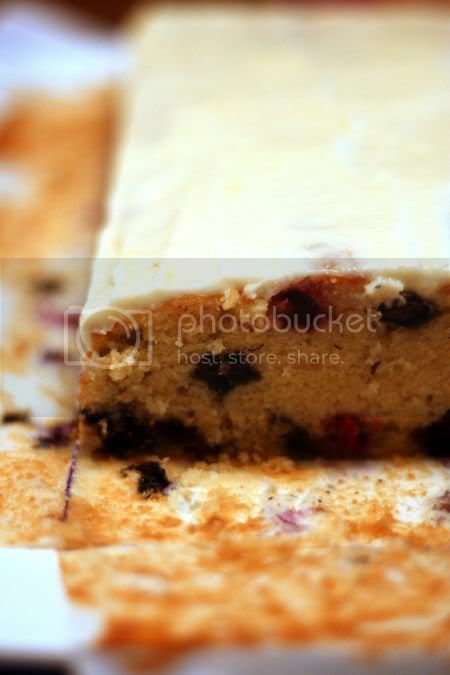 I'm enclosing the blueberry tea cake's recipe below, so enjoy making it! For more fun decorating pictures, see my Flickr set. Preheat oven to 180 degrees Celsius. Grease a 23 x 33 cm baking tin and line with baking paper. I cut the paper a little longer on the sides, so I can lift it up from the pan and peel it off after it cooled down. Mix the sour cream with soda bicarbonate and set aside for 5 minutes. Beat butter and sugar in a bowl until light and creamy. Add lemon zest and vanilla, beat to combine. Beat in the eggs, one at a time and add the sour cream mixture (which would have puffed up and became fluffy!) and mix until evenly combined. Put blueberries into another bowl and toss with a little flour. Sift the rest of flour and baking powder over cake mixture and fold to gently combine. Gently fold in the blueberries. 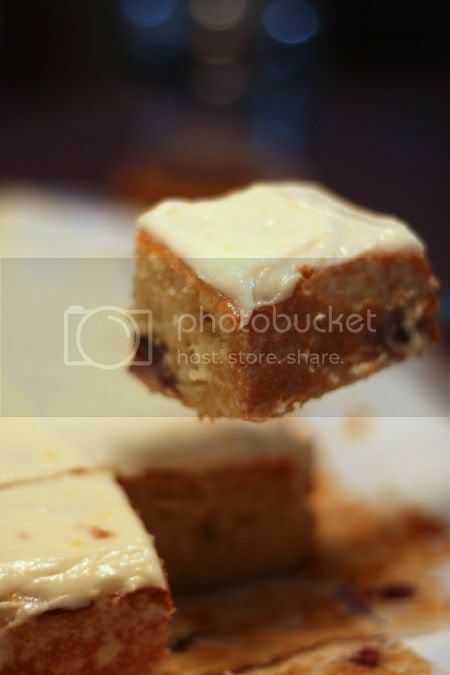 Spoon mixture into tin and bake for 45-50 minutes or until skewer inserted into the centre comes out clean. Leave to cool in the tin for 10 minutes and turn onto a rack. Alternatively you can let the cake cool in the pan and remove by just plucking it out with the longer sides and peeling the paper off before icing the cake. To make frosting: Beat cream cheese, butter, lemon zest and vanilla together in a bowl until light and fluffy, then mix in icing sugar until smooth. Top cake with frosting or you can even do a lemon drizzle where you just melt icing sugar with a little lemon zest and lemon juice to drizzle over warm cake. Tashi Delek everyone! That's auspicious greetings in Tibetan that you can find in Kechara Oasis' menu. 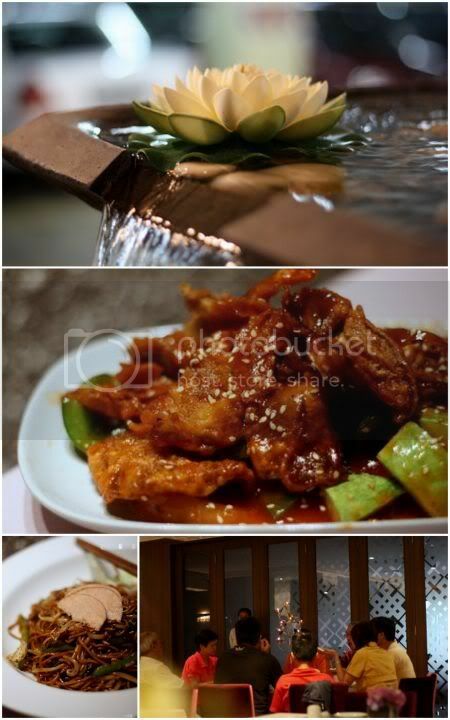 Although it is labeled as new age vegetarian cuisine, their chefs were sent to Tibet to receive some culinary training. 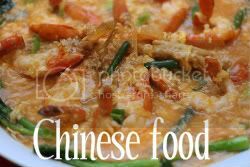 Loads of that written up on the Net so google and find videos by Ho Chiak!, invited food reviews and etc on this place tucked in Jaya One's carpark! We zoomed in on the Tibetan goodies on the menu, which ain't much and consists of ando yak beef, momos, camel meat with butter sauce, shabalay, tingmo (steamed buns served with a special sauce), asa bhima, tibetan baked bun with fillings and tibetan butter tea. Not being able to order everything, I settled on the momos (the main reason why I wanted to eat here), the shabalay and the butter tea. I decided to mix and match the food with the other vegetarian choices like the fried noodles and a sweet and sour mushrooms (I love sweet and sour!). Before the meal, they served us a complimentary clear soup, which according to Splashie Boy, "tastes just like what your mother makes at home!". 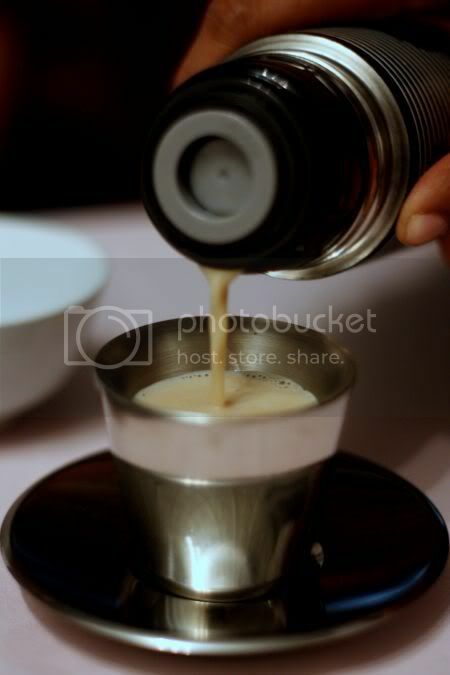 We were served on tibetan butter tea in hollow metal cups from a flask to keep the tea warm. I can imagine it'll taste awful when cold but drank hot, it was very good. Smooth with just a hint of butter at the end. I wanted to compare their momos (6 for RM21+) to the Khukri (the Nepalese place in KL, which I never did blog about despite visiting it during an FRU raid) but to be honest these ones just didn't make the cut. 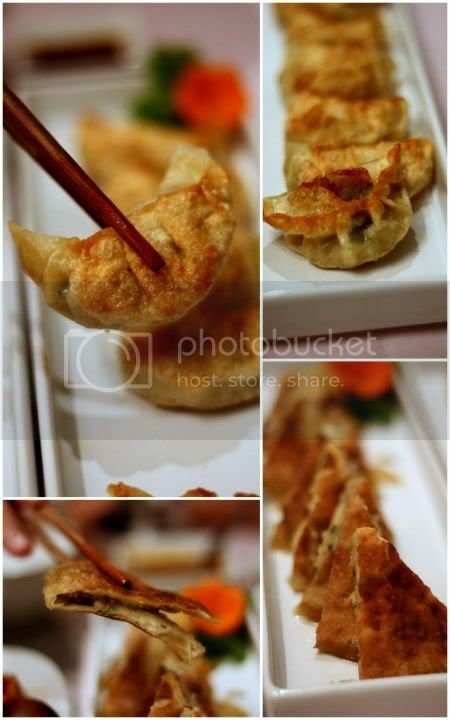 Shaped like gyozas, they're steamed and pan fried till crisp. The vegetable filling within just didn't have any oomph at all and if it wasn't the chili oil dip, it would be absolutely tasteless. Note that although Khukri's version is shaped like small xiao loong baos instead of gyozas, this does not mean this version is not genuine as in Nepal they shape them both ways per my friend who has been to Kathmandu. Next was the shabalay (RM18), a kind of crispy pancake with potato fillings, which came with a curry dip. We both felt this was a little too oily and again not much taste unless you dip it with loads of curry sauce. The dry fried noodles (RM14 for a small portion) was pretty good and tasty with some vegetarian ham on top and while the sweet and sour sauce for the mushrooms (RM17 for a small portion) was not as good as the one I love at Chef Choi's, this was pretty decent. Honestly, I thought the food was average tasting only as the Tibetan cooked items just didn't "wow" me at all. 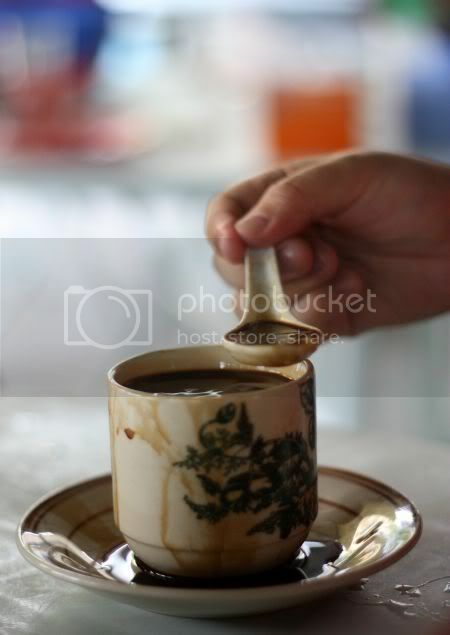 The only item I really liked and thought was very good was the smooth and decandent tasting Tibetan butter tea. Am not sure if it is just my tastebuds as I've read glowing reviews of this place from others, so I may be wrong or may be I'm not so into vegetarian food? Larger pictures are in my Flickr set. Eat Drink KL also did a review on the Tibetan items eating the yak, camel meat and tingmo we didn't get to try. Babe in the City had a great Chinese New Year meal here. A very quick one for today! Been quite busy with work hence I've not been exploring much but we did recently discover this little gem in Giant Shah Alam. Around the food court (don't eat the hotplate noodles, tastes yucky with the starchy sauce! 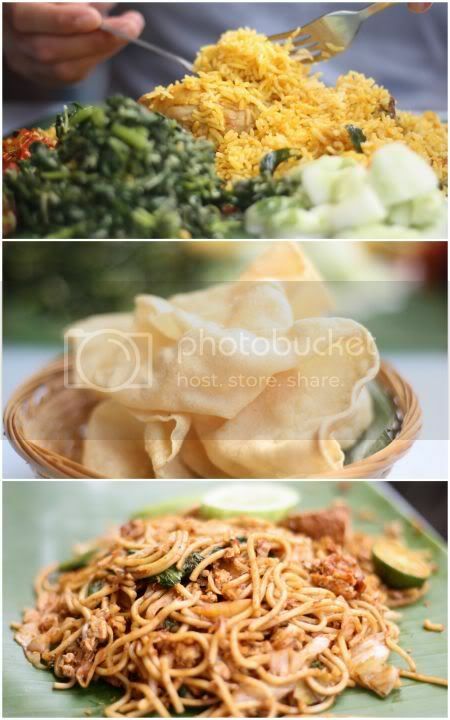 ), there's also small stalls fringing the food court that sell all kinds of food like rojak, beef soups, cold drinks, popiah, nasi lemak and this particular stall specialising in various types of rendang. You can opt to eat the spicy rendang with yellow glutinous rice (pulut kuning), roti jala, ketupat or nasi impit (compressed rice). 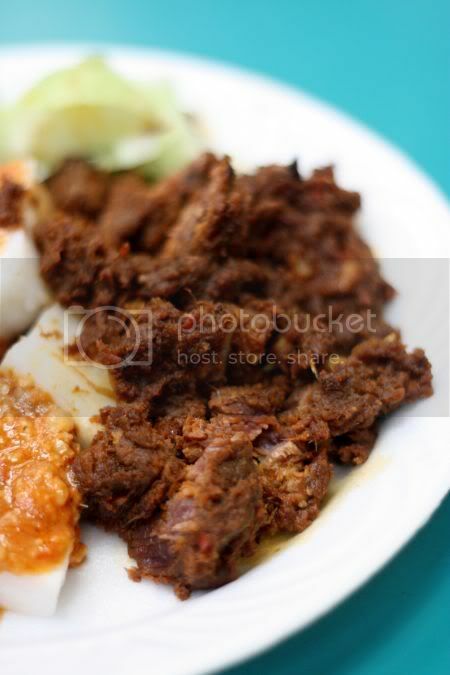 I've always loved rendang tok with its dark brown fork tender beef chunks with a slightly sweetish taste. 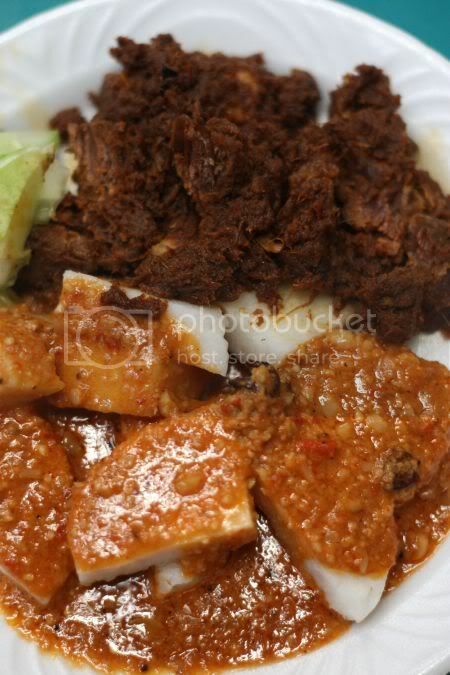 Usually cooked until dry for many hours in coconut milk, this rendang is said to originate from Perak. Not usually found everywhere here, this stall's version is excellent and priced reasonably as a plate of rendang tok with compressed rice (nasi impit) drizzled with peanut sauce is RM5.50. Aside from rendang tok, she also sells rendang ayam (but it is more like a watery rich coconut milk curry with chicken pieces), rendang kerang, rendang paru paru and etc. We're still discovering what else is good in her stall but I definitely won't mind returning here to pack some rendang tok and ketupat from her, if I have friends over or when it is Raya. 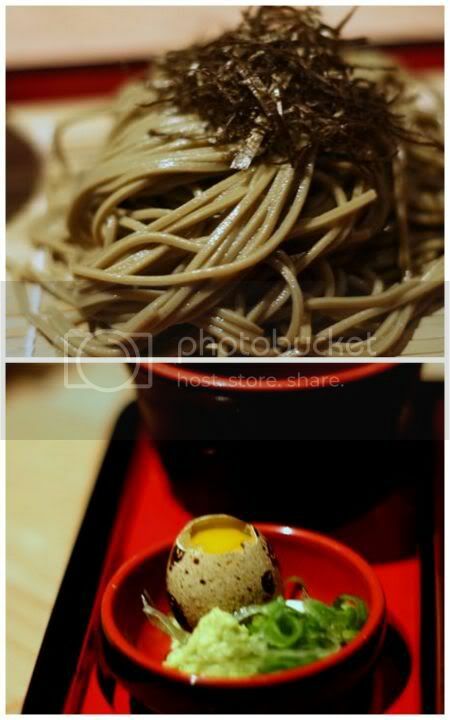 Let's switch over to some Japanese food after a bout of Chinese traditional favourites. Rather than dine at our usual Taiwanese fave spot in Desa Sri Hartamas with my mother (she was craving for the poached chicken), we decided to try this new place I read about from Eat Drink KL. Getting here is a breeze with just a slight jam on Jalan Ampang and the white bungalow is tucked right behind Hock Choon's supermarket was easy to locate. Parking was ample too since not many people know about this place but I'm not too sure how they'll handle it later on when more places open up. On a weekend night, the place was almost half full with families and groups of friends dining out. 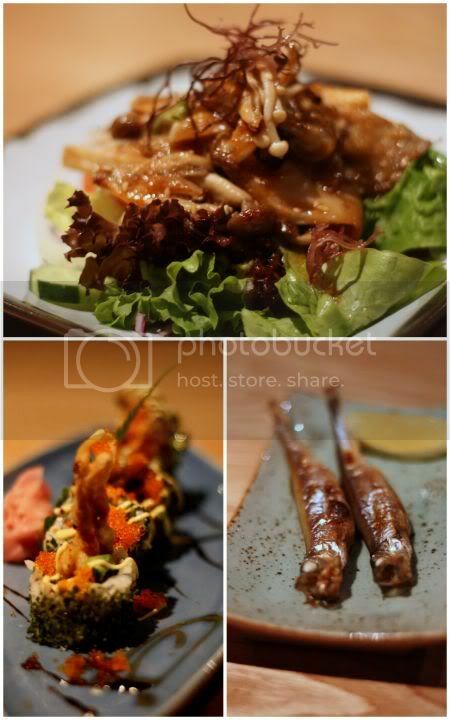 This place is part of the Fukuya chain but unlike the other outlet that is famous for their kaiseki menus, you find the menu here to be the typical run of the mill Japanese restaurant with sashimi, teppanyaki, makis, tempura and etc selections. Since it was the 2 of us, I ordered just a small amount of food to share. 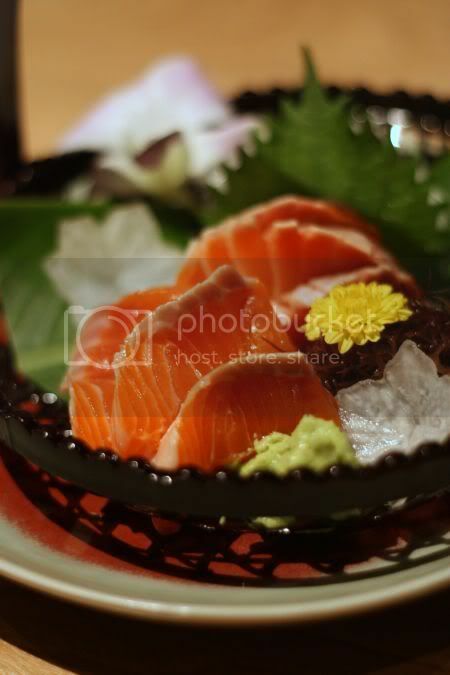 My mother always insists on salmon sashimi (RM28+)and Fukuharu's version came in a black bamboo basket like Fukuya with white radish flowers and a yellow chrysanthemum flower. Not a lot of people know this but I often eat my sashimi with the petals from the flower. You can either just eat the petals with the sashimi (it adds a nice fragrance) or dip it in your soy sauce if you prefer. Also, just remember one important sashimi rule - never ever mix the wasasbi with soy sauce to a paste. You just need to dab the wasabi on the fish and then dip it in the soy sauce. The Japanese will frown on you, if you mix the wasabi in the soy sauce. I wanted some vegetables hence it was a choice between the mushroom salad, sashimi salad or a seaweed salad. Being a fungi lover, I eventually went for the mushroom salad (RM18+) - a mix of pan fried mushrooms with a bit of sauce topping lettuce leaves and Japanese cucumber slices. While the salad was pretty tasty with the soy based sauce, it felt quite ordinary. Since I was just eating cold cha soba noodles (RM22+), we had an order of maki. Seems the soft shell crab maki (RM20+) was one of their specialties. Instead of seaweed surrounding the maki, this version uses the powdered seaweed hence you don't get the textural contrast of crispy seaweed with the rice. I quite liked the maki probably because they had super crunchy ebiko topping (a sign of freshness as most ebiko is mushy from the freezing) and a thick reduced soy sauce that reminded me a little of Max Kitchen' s reduced balsamic vinegar minus the tanginess. Not wanting to overload on food, instead of the usual grilled saba fish, we went for the smaller shishamo fish laden with eggs (RM18+ for 2 pieces) that was also good. Overall, I reckon food here is good and fresh. 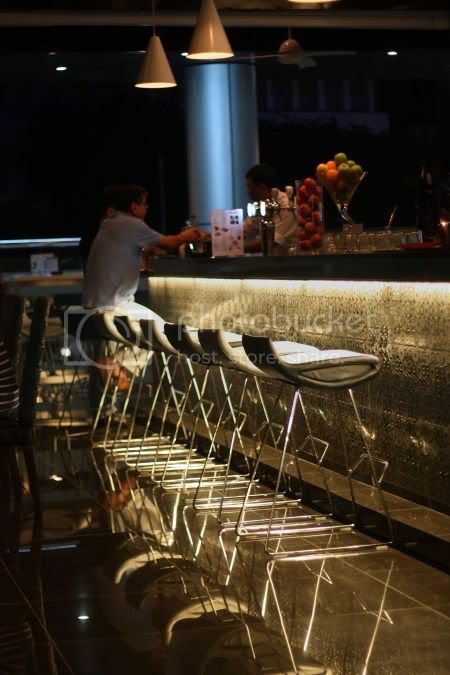 While the service is enthusiastic, it can get slightly frustrating as they use Myanmar wait staff who can sometimes not understand what you ask them. Hence for anything more complicated, ask for the head Malay waiter or else you'll be tearing your hair out. My only complaint about this place is the menu is quite typical of other places but then since it is still in the early stages, I guess in the future they can add more exciting menu items and hopefully weekly specials flown in from Japan. What would be most interesting I guess is if they start serving their value-for-money lunch kaiseki sets! 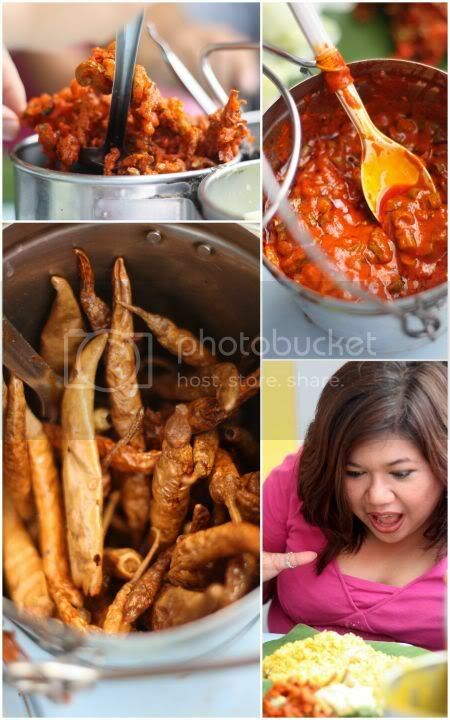 Betcha that will go down well with the ladies who lunch from Ampang after they do their grocery shopping in Hock Choons! 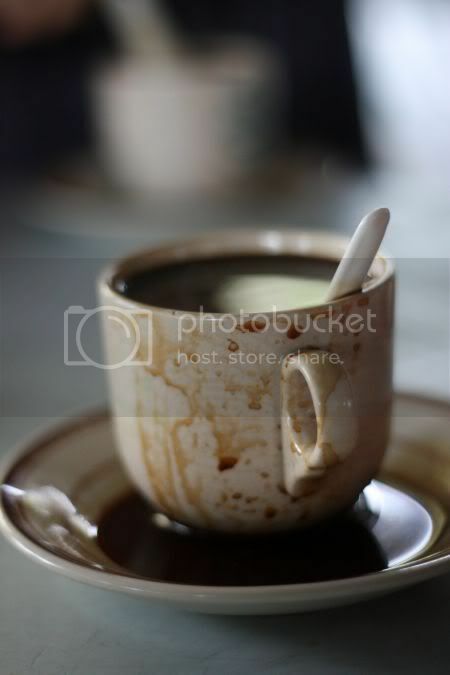 coffee in a chicken rice joint??? Running around Precious Pea and her group of buddies often mean discovering great gems like this small stall. She had earlier blogged about this chicken rice stall perched on top of a hill, when they took her family from Melbourne around. 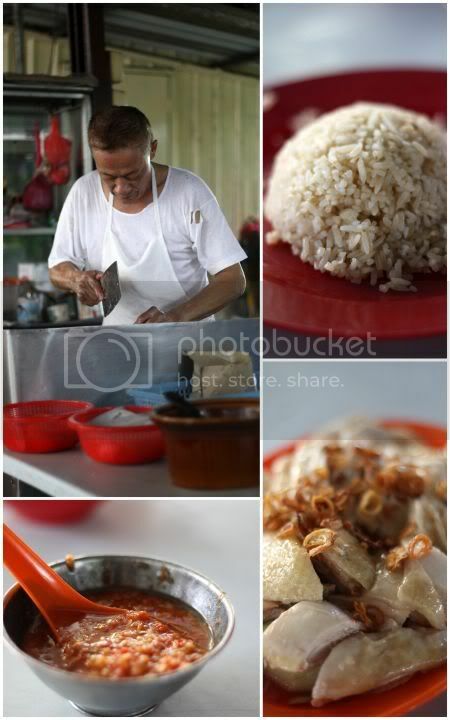 During our recent Cheras food crawl, this was one of three stops we made. 1. you don't mess with me ok? I have a big cleaver!, 2. the awesome chicken oil coated rice, 3. smooth chicken, 4. no watery chili sauce here. Even though it was almost the last one and our tummies were pretty full, I was looking forward to the chicken rice, which was described as incredibly good that one would need to have 2 bowls of rice to satisfy your cravings. I've vaguely read about this place from guidebooks hence I knew about its existence but never got round to searching for it. When we got here, it was quite late (around 2pm) but there were still tables of people eating and most importantly chicken plus rice. 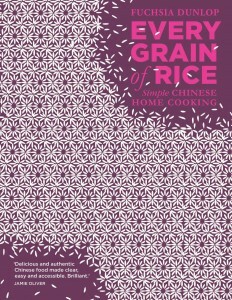 The rice was excellent (not the fluffy pale yellow margarine type!) but slightly brown with each grain perfumed with chicken oil! How I wish I had more stomach space to eat more rice! Chicken was good too - smooth texture and firm meat. So far, it passed 2 out of 3 tests and for me, the final test is the chilli sauce and it was good too - right amount of chopped chillies and lime juice! Verdict - excellent chicken rice! Eating so late became a blessing in disguise, as we (even Precious Pea's friends didn't know this!) discovered the stall owner (whom some refer to as Suki, which means "mate" in Hainanese per Lim Kit Siang who once did a rare food post!) is also a whiz in making coffee! 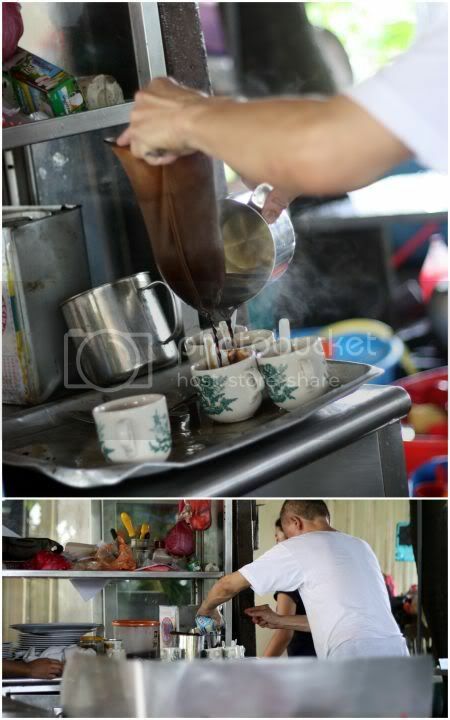 Someone ordered coffee to drink and since the owner was not busy chopping chicken, he started making coffee from scratch, brewing it with a coffee filter bag, scalding the cups in hot water, adding coffee to each cup and topping it with condensed milk and evaporated creamer. He impressed us so much, we all ordered a cup each to sample and it was incredibly good - smooth coffee with just a hint of sweetness. So now we know! Arrive here late around 2pm, eat your chicken rice and wait for the owner to be free enough to make you his signature coffee. Yawn! Exhausting weekend running around as usual plus I worked on Sunday. Such peace and quiet in the office, that it was extremely productive. For dinner, I wanted to try something new hence my friend S suggested this place she read from the papers. I vaguely remember my mother raving about this place that serves Hokkien cuisine. Must be good stuff since my mother is Hokkien lang! Tucked in a complex behind the main road, getting here can be quite scary if you're doing it alone. Luckily when I got here, there were still people around the ground floor area hence it was not too bad. The restaurant in on the first floor and you have the option to sit inside the enclosed air-conditioned area or outside on the balcony. Packed with families having their weekend meal, we quickly ordered their specialties and waited for the food to come. This place is super popular having been featured by Chui Ling on her television series, 1 day 5 meals (incidentally I caught an episode on Saturday night and she has a blog with all her recommendations) and various English and Chinese newspapers including a thumbs up from the famous Lai Meng, the actress from the oldtime television drama, 4 Sekawan. We went for the Hokkien braised pork (foong yuk pork with kan sui kow), which was served with alkaline kuih. The chewy white cakes were an acquired taste even though you ladle loads of sauce and the fatty pork bits. 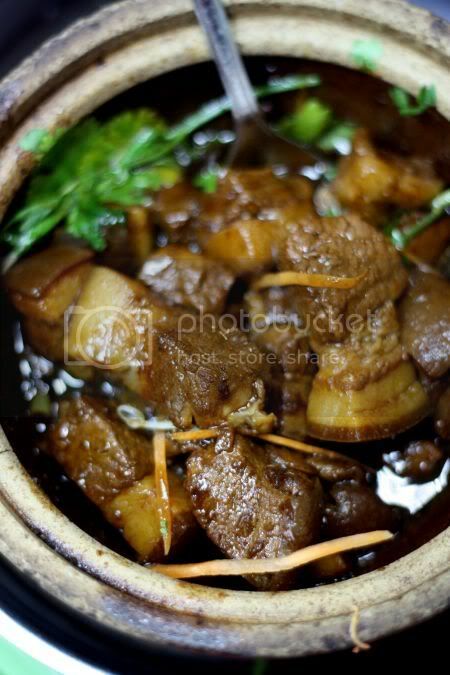 Braised with dark soy sauce in a claypot and we reckon a hint of Chinese herbs, the pork was sinfully good. Each fat slice of braised pork is a contrast of textures; the combination of slightly harder tasting meat with the thickly cut melt-in-the-mouth fat. Yums, porky goodness! 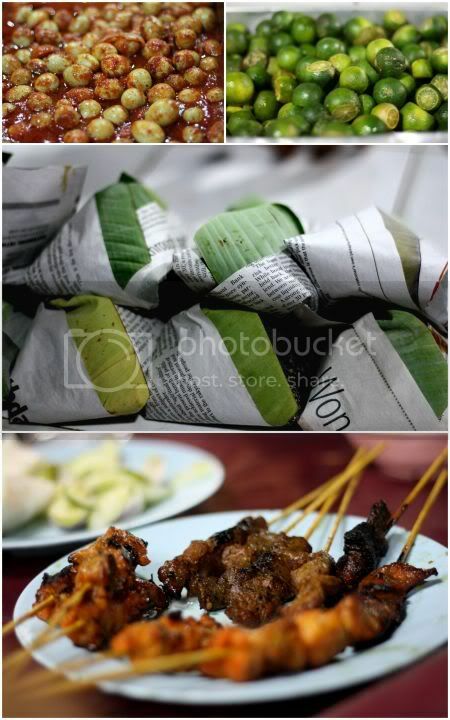 Another signature dish, we loved was the fried crispy brinjal. 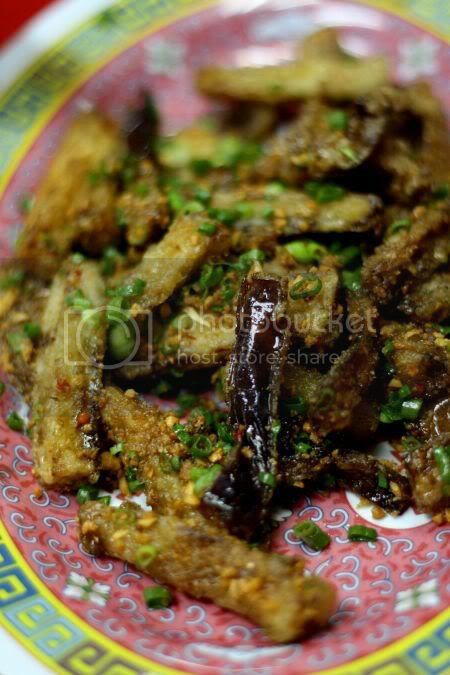 Sprinkled with salt and squeezed till dry, the eggplant was coated with flour, fried till crisp and stir fried with finely chopped fried garlic bits and chopped spring onions. Addictively good stuff. However the texture is a little different from normal fried eggplant as squeezing the moisture out means no soft centre in the middle when it is deep fried. Other goodies we also had was the deep fried tofu - nice and soft with a crisp exterior, the beancurd was home made with a slightly unsmooth texture. 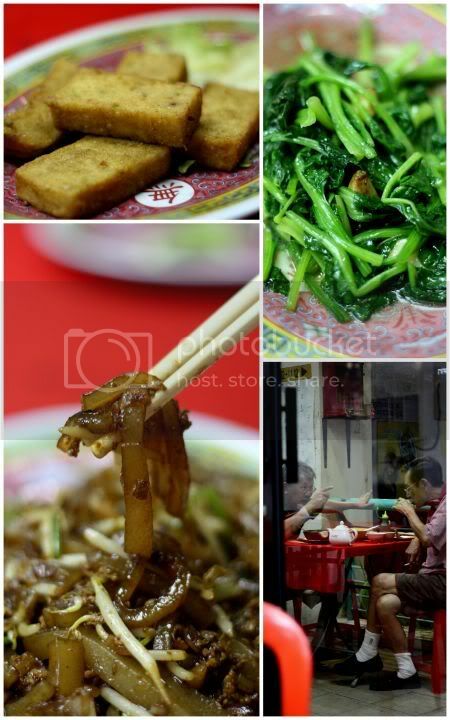 Finally we had the delicious tapioca flour noodles fried with minced pork, bean sprouts and Chinese parsley. The texture of the noodles is slightly chewy but not very noticeable as they shredded the noodles in thin strips. Originally, we also ordered fried glass noodles (tung fun) with bittergourd but since that didn't come we changed it to a fried vegetables with garlic that balanced off the sinful meal we had. No breakdown for the meal's prices but the total cost for dinner was RM70 (RM66 for food and RM4 for Chinese tea, which we drank continously to stave off the oiliness). Looking through the menu, I could pick out other food I don't mind returning to try - Foochow red chicken, fried sweet potato flour noodles, Ulu Yam Lor mee and etc. For more pictures, see the Flickr set. Cikguas227 who went for a family dinner there and was so impressed with the food, he got the pictures from the restaurant and added it in. Foodbin who gives us a little history about the restaurant. There's no denying the King is back! Just sniff the air and you can find the fruit, all of us have a love/hate relationship with. My friend S is currently entertaining her friend A from Sydney and high on her priority list was indulging in some creamy pungent tasting durian. 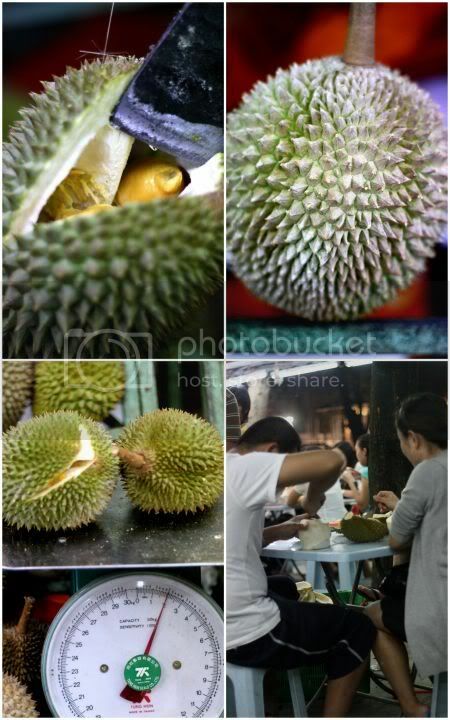 Best place we reckon to satisfy her cravings was in SS2 where overnight, stalls have sprouted up offering various deals on durian, since it is that season of abundance. There's a few stalls to choose from (including those that claim you can eat as much as you can for RM10) but we decide on the one which has been around the longest - durianss2. They even have a website with all the different varieties even though it has not been updated for quite some time. Here you select the variety you want and they'll weight it and charge you. Unlike the other stalls, this one seems to be the only one with hanging plants decorating their makeshift tents. The rules here are simple, just sit down and enjoy your durian. You can ask them to select the different varieties and sit on the plastic tables. Tissue and even water is provided. If you prefer, you can even order coconut water (meant to cool you down since durian is heaty). Sadly they didn't have any Tracka varieties (which my friend wanted) but we had excellent Musang King or Mau Sang Wong that was creamy, thick and fragrant. It is also known as kunyit since it is bright yellow like saffron. Other varieties we had were udang merah (red prawn in Malay) and D96. 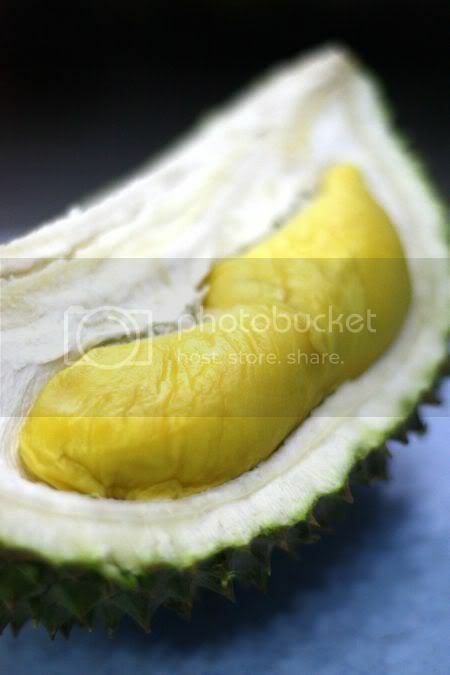 While eating the creamy durian flesh is full of pleasure, one problem is the stinky fingers when the smell lingers on and on. 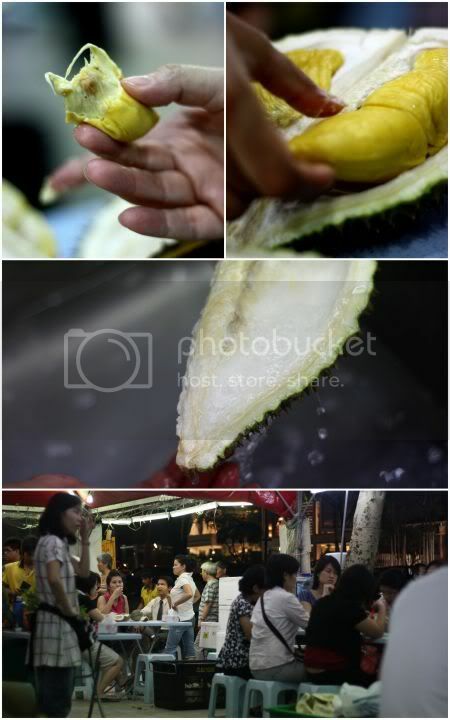 One way to get rid of the smell (and nope, it ain't using a spoon to eat your durian! Sacrilege as the best part is feeling the creamy soft texture while you slowly lap it up) is to use the durian after you have eaten it to wash your fingers. Believe me, it works so give it a try! Better go and indulge in some creamy goodness before the season is over. More pictures are in the Flickr set. Food - how do you define it all? 4 letters that mean so much to all of us, especially those who are totally passionate about it. It often amazes me how food lovers "click" on another level, when it comes to talking and deciding where to eat (even when they're eating lunch, they're already planning the next meal). We're very blessed to live in Malaysia, as we get to eat every where, any where and any time (one of the main reasons why I won't leave here for anywhere else!). Through the blog, I've met loads of like-minded people who love their food so much, they don't mind going to the ends of the earth to hunt down what's good. The best part of course is the sharing of information. While the hunt for the perfect char siu may be an unforgettable experience, I find divulging to others where and how to get to that perfect char siu even more exciting. Being proud of what Malaysia has to offer in the tummy stakes, I often get roped in when visitors from overseas pop by, to give them a gastro tour around town. While they may be strangers at the beginning, after a little nasi lemak with fiery sambal, you find that you'll be chatting like old friends. Last week, we had the opportunity to meet up with Karim & Hubert, two French fellas who are doing an amazing feat on their year off from work. Their mission - to cycle from Beijing to Paris for one year, without flying. They took off from Beijing in March and made their way down the Silkroad and Tibet but unfortunately they hit a bump there, as they weren't allowed to cross the border there to India. Hence they ended up in Malaysia vide Laos and Thailand, hoping to find sea passage to India. From what I heard, as they're not able to secure a ship willing to take them aboard, they will have to abandon that idea of not flying. Like good Malaysians, we gave them a little "local food tour" - nasi lemak CT Garden for loads of side dishes and nasi lemak bungkus, chunky beef and chicken satay from O Mulia and sinful charred black Hokkien Mee with extra fried lard (all the sin is gone, claims my friend since you have to render the oil out to make it crispy! Yeah, right, tell that to our cholestrol levels!) from Ah Wa's just off Jalan 222. If you want to follow the duo on their travels, see Karim's picasa web album. Coincidentally, the floggers also had got together that weekend, to hit Old Klang Road to fulfil an almost year long promise Precious Pea made to Black Tie White Lie to bring him eat the famous Kung Fu Pan Mee in Taman Sri Sentosa. See what I mean, we love food so much that we don't mind waking up at 8am to meet up! 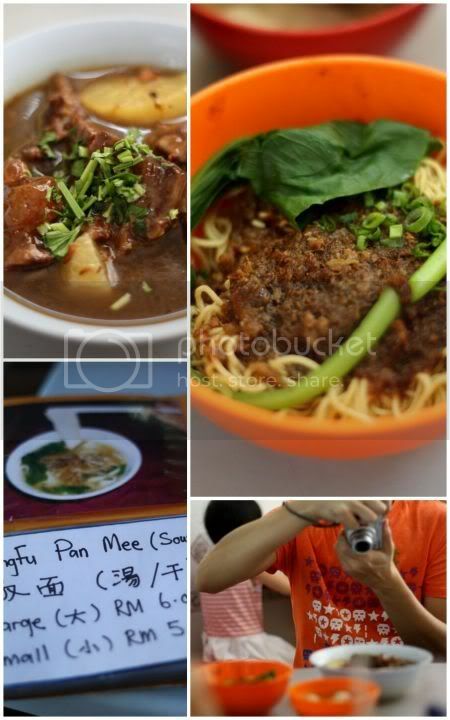 No pictures of the super long and "pappardelle" lookalike pan mee, as I accidentally deleted my images. It was great fun with 14 people cramping in 3 plastic square tables at the place. To maintain some order, the waitress had to ask us to hold our hands up (like school) to place our orders. The pan mee, still remains good with loads of texture but I felt the chilli sauce accompanying it now is too smooth and processed looking. Sigh, there goes one important part of the dish. 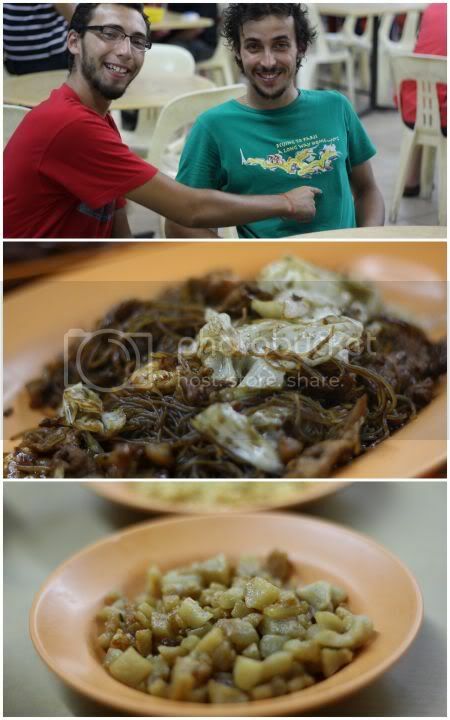 Next it was the beef noodles at Yang Kee where we discovered that quality of the food there has detiorated tremendously. Seems the owner passed away and his wife runs the show. Guess she made some changes to how items are cooked as the noodles weren't cook (too much flour and soft), minced beef topping was not tasty anymore just like the stewed beef with white radish. Feeling dissapointed, we hit the market to get the much raved butter cake. 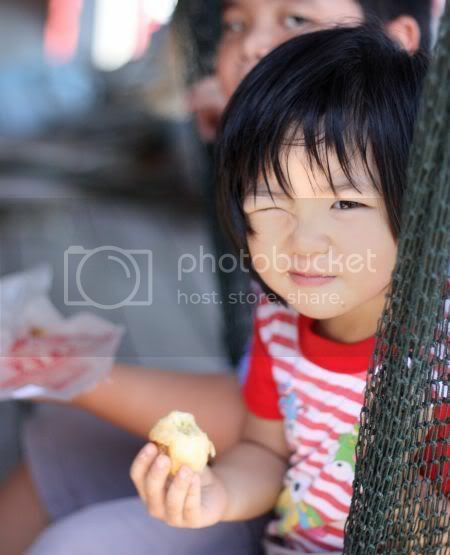 On the way, I took pictures of the doughnut and sweet potato balls stall. I preferred the chewy taste of the sweet potato balls but didn't think much of the doughnut though. Butter cake was a crowd favourite as everyone was queueing up for their sweet share (you can cut them to halves or quarters). I got a selection; chocolate cake, butter cake and marble cake. The crumb of the cake is very fine, moist and pretty tasty but I don't think it used real butter though. 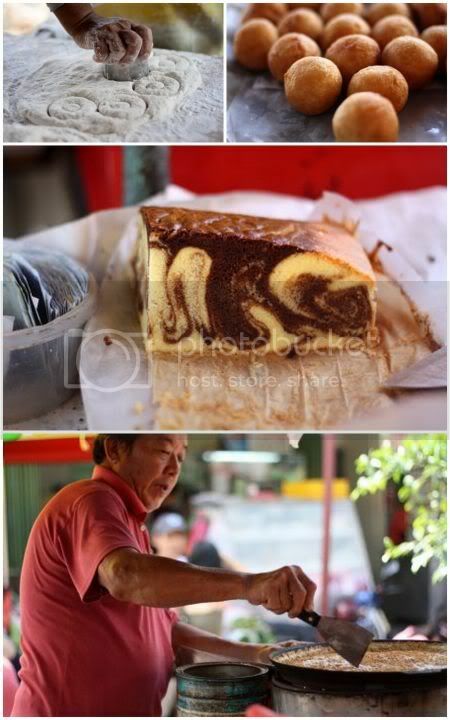 The stall also sells the large peanut pancake, which we tried (as it looked very good and it was!) a slice piping hot from the skillet. While the morning crawl's selections weren't great, the company was fantastic (Nice meeting everyone even though I didn't get to say hi to everyone - thenomadgourmand, Unkaleong, Simon Says, You Get What You Give Sometimes, Ipoh Mali Talak Sombong, Kusahikeat, Food4thot, Motormouth from Ipoh, Food Cookies, tankiasu and Kampungboycitygal.) For more pictures, see my Flickr Set. Available during the morning market only. Meeting up with friends you rarely see is one of the sweetest things especially coupled with great food. 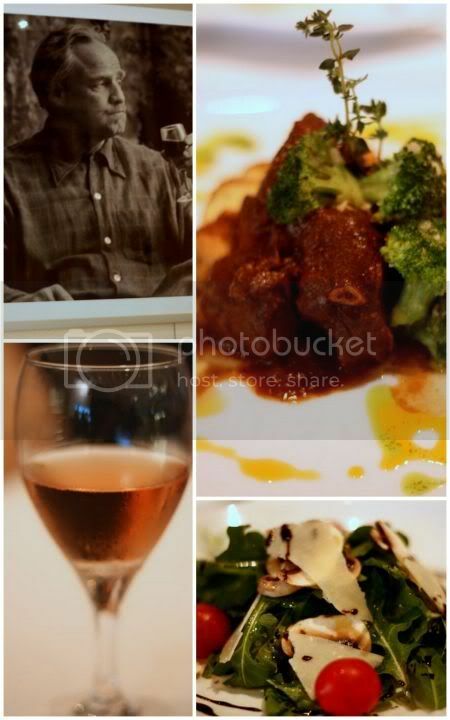 This time round, we decided to give this Italian place a try since my friend, P had recently went for the chef's cooking class at The Cooking House. I'm glad we did as the food was the kind of homey goodness I love (and also cook at home). Company was great of course, with everyone catching up on their Italian trips (my friend MY did a tour of Italy for 2 weeks just before my trip.). Chef Enzo who is in charge of the kitchen at this small unassuming place (you can't miss it - it's right next to the biggest duck in SS2 aka Hoppy Duck so follow the quack) adds an Italian homey feel to the food here. In fact, to be honest, his pasta dishes with the tomato sauce kinda reminds me of what I cook at home. Originally from Pizza Uno, Chef Enzo also teaches pasta and desserts classes at the Cooking House, which is where my friend met him over some intricate twisting of pasta dough to make tortellini. We had a riot here, ordering loads of dishes to share and taking forever to decide but Patrick, the nice waiter was very patient with all of us (he's quite a character too!). 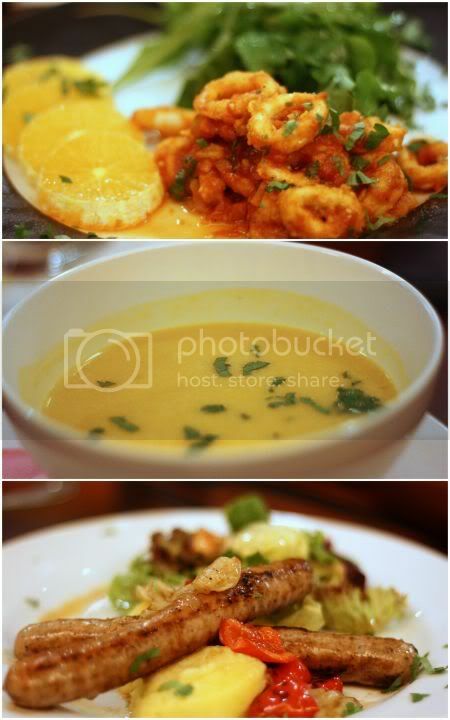 To start off, it was an array of appetizers to share - the calamari fritti (RM22.90) with a generous portion of rocket on the side, the insalata del casa (RM22.90), a salad with chicken bits that was quite tasty and the mussels with pasta (RM31.90). I didn't get to try much of the calamari but unlike the crispy version, this one was coated in a tomato sauce hence it was a little soggy. Nevertheless it was still very tasty. Salad was laden with chicken bits, sundried tomatoes with crisp salad leaves that we all enjoyed. Mussels were good too, a little bigger than I expected and it totally reminded me how often I want to buy a bag of Boston Bay mussels to make this simple dish with chopped garlic. Soups were also ordered, we all loved the cream of pumpkin (RM9.90) vs the 3 mushroom soup (RM9.90) for its subtle and creamy taste. Somehow the mushroom soup lacked much oomph for us and we preferred the chunky version you get in delicious instead. The kids had a large chicken and pineapple pizza (RM29.90) to share. I didn't get to taste that since the guys and the kids polished it off but it looked good from afar. Sausages were also ordered by D and lucky fella, his order got messed up hence they gave him 2 types - a spicy Italian sausage and German bratwurst. We all preferred the spicy one vs the more bland tasting but juicier bratwurst. We all had various pastas - a spicy penne amatriciana (RM26.90), a linguini pork pasta using bits of Sakura pork (RM26.90), linguini carbonara (RM26.90) and everyone's favourite, the orecchiette with tomato sauce, eggplant, spinach with ricotta cheese (sorry no price, as they lumped the 2 open food prices together!). The orecchiette, which is also known as "little ears" went so well with the vegetable combination that we were all asking to share my friend's pasta. The next time I go, this will definitely be my order here! Despite how much we ate for appetizers and mains, we still found room for desserts (!) after some persuasion from Patrick. Luckily we did, as we totally enjoyed the sweet treats. Tiramisu (RM14.90) came served in a martini glass and got all the camera action but I thought it wasn't too fantastic as we totally preferred the sticky date pudding (RM14.90). Served with an addictively good butterscotch sauce (Nicholas, kept ladling it into his gelato, RM13.80 for 2 scoops and beaming happily! ), we all couldn't help digging into the pudding. Last but not least we were given a free slice of the ice cream layer cake - Splashie Boy loves this as it was a great combination of creamy gelato with an icy tart strawberry layer on top. Do drop by for italian home cooking (just don't expect any bells and whistles here) like any Italian nonna would cook for their doting grandchildren. They also serve main meals like lamb shank and roast pork (they use Sakura pork). Enzo also takes people to Italy for gourmet tours hence, if you are interested in discovering his country, you can also enquire at the restaurant. 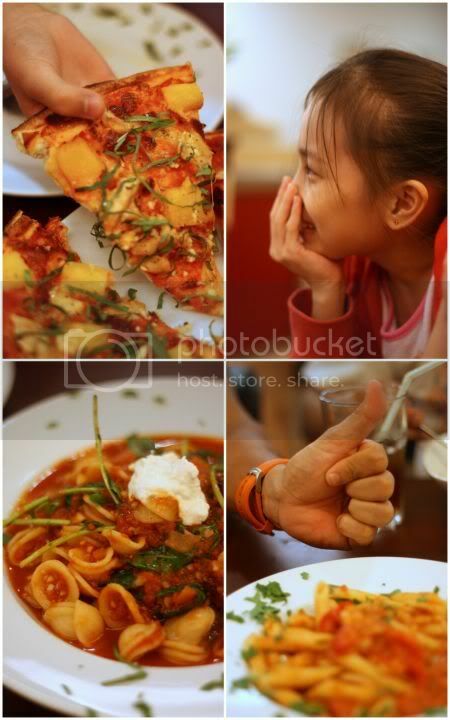 Classes to learn how to make pasta and the desserts served here can be found at The Cooking House, Desa Sri Hartamas. More pixs are found in my Flickr set. Kyspeaks & 3iLing who both did a food review here. Guai Chai Kid who enjoyed family dinner there. Precious Pea & she, the epicurious girl who ate here back in 2007! nudge, nudge, wink....why are you taking my picture? For some laidback action, how about dropping by this place that is slightly less touristy compared to Pasir Penambang? This small fishing village has been made famous by Precious Pea, who started a string of blog posts about this place after she discovered it with her group of friends. Last week, I was privileged to join them for a jaunt to this seafood joint. 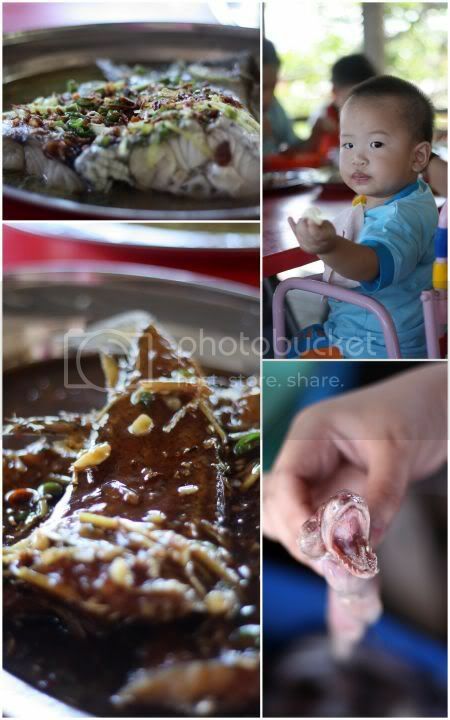 fishy tales - 1. steamed siakap fish, 2. you want some of mine?, 3. flatfish with soy bean paste sauce, 4. mini Jaws! strikes again. Best to come before the crowd or else, from what I heard it can get kinda ugly i.e. people fighting over seafood! First, we dropped by the fishery to check what they had and coincidentally, we spot the restaurant owner buying a big bag of clams from them. Seafood looked fresh hence we decide to return and stock up. The restaurant is actually part of the family's house, hence you find the family members hanging around the place in hammocks sleeping or even a mahjong game happening nearby. At the entrance, peek into the kitchen (a wet and dry one) where you will see kids hanging around to help out since it is the school holidays. I guess these will be aspiring chefs to take over the family business in the future. Like any seafood restaurant, there are tanks keeping fresh prawns here but unlike the usual glass tanks, here they have makeshift plastic tanks or a flat tak filled with crabs all waiting for to escape or meet their fate in the kitchen. Everything is haphazardly placed; old rusting bicycles, long forgotten teapots in a cupboard and etc. You can choose to sit at 2 parts of the restaurant, the front part where it faces the river and that infamous wooden loo (literally a hole in the wall!) Precious Pea had blogged before as it is much cooler with a view of the fishing boats. Alternatively the second part is sealed up with a proper toilet and a television for you to karaoke your blues away. 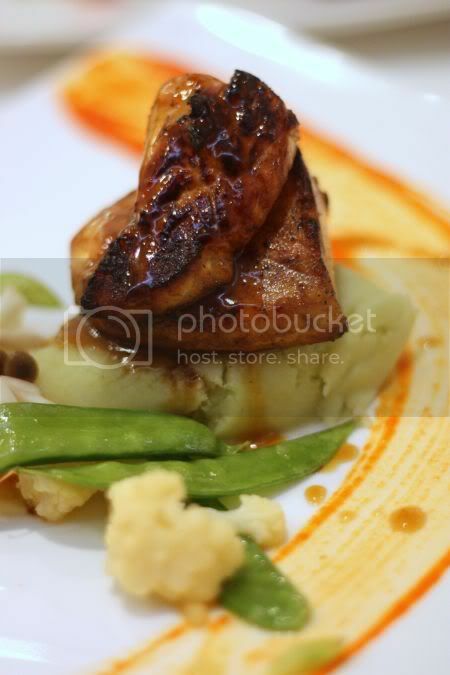 The food is simply gorgeous and very simply cooked, to bring out the sweet natural flavours of the super fresh seafood. 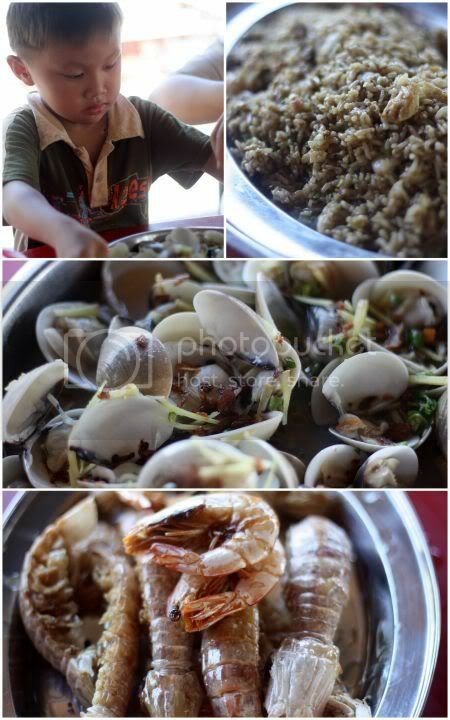 I loved the steamed clams (RM12) lightly drizzled with sesame oil, ginger shreds, chopped chilli padi and fried garlic. The soup at the bottom was the best part and I drank it all up savouring the sweet flavour. The super crunchy prawns (RM26, 2 types of plain and mantis prawns) were chomped up in seconds. As they were crunchy, I ended up eating the whole prawn including the shell but for the mantis prawn, since the shell was a little harder, I didn't dare crunch it down. Finger licking good, as the prawns were sweet tasting too. glimpses of life here 1. 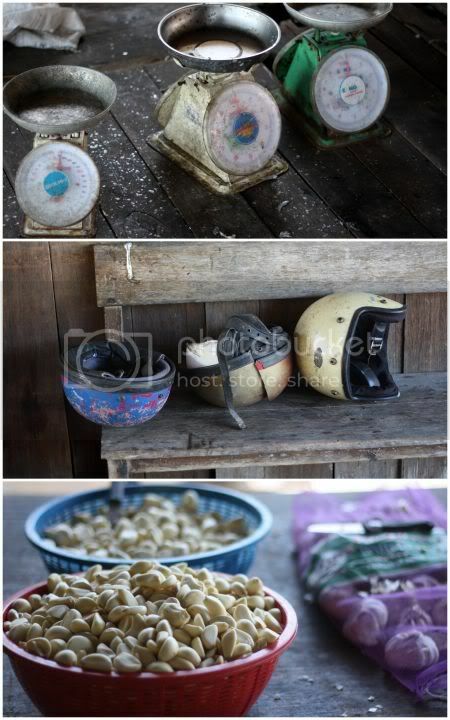 3 weighting machines; none are blind, deaf or dumb, 2. motorbikes are a popular form of transport here, 3. Around here, we're not scared of vampires, so please no Twilight and Rob Pattinson here, ok? Steamed siakap (RM17) was next with its smooth flesh and simply adorned with the same items used to cook the clams. We also had the unusual flat fish fried and cooked in a slightly starchy soybean paste sauce (RM12). I loved that sauce as it was not too salty (hence I could just eat it on its own) and the fine flesh of the flat fish. Instead of white rice, we had fried rice (RM5)with bits of prawn and egg that was nice since it was not oily or wet. 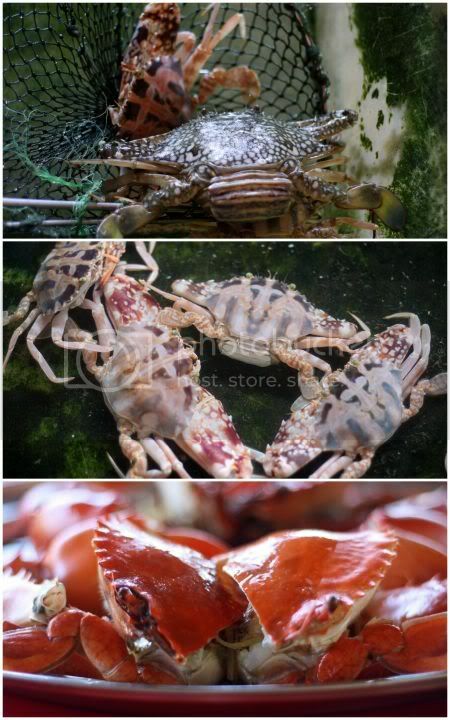 Last but not least, was the mudcrabs (RM30) simply steamed with egg white. Needless to say, we slowly ate every morsel of the crab flesh that was so incredibly good. Later, we revisited the fishery to stock up and also dropped by Pasir Penambang to buy fishballs, frozen scallops and banana chips. 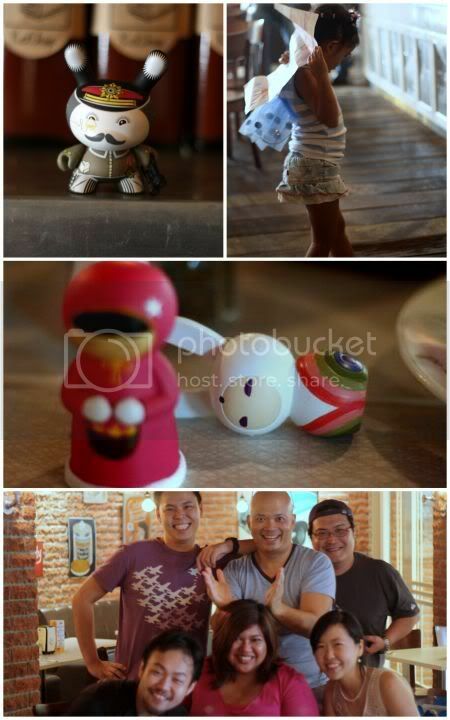 It was all great fun, thanks to Precious Pea and her makan gang and I reckon I definitely need to do this more often! For loads more pictures of the place including the fresh seafood at the fishery, see my Flickr set. Tummy Thoughts also made a trip here.